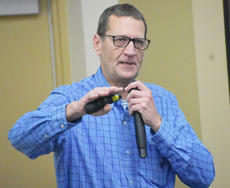 Agriculture Extension Agent Pat Hardesty gives a brief presentation on the history of extension services in Taylor County. 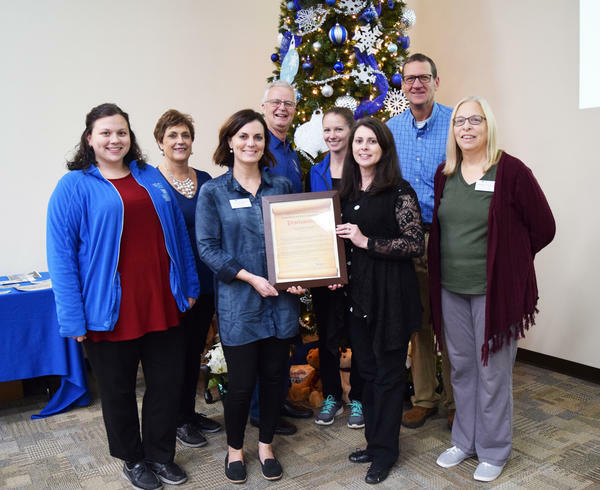 The staff of the Taylor County Extension Office pose for a photo with the city/county proclamation issued by Taylor County Judge-Executive Eddie Rogers and Campbellsville Mayor Tony Young. From left, current Taylor County Extension Office staff Amanda Curry, Carolyn Morris, Audrey Myers, Gerald Gribbins, Kara Back, Amanda Sublett, Pat Hardesty, and Angela Freeman. The Taylor County Extension Office held an open house last Thursday to celebrate its 100th anniversary this year. The event was well attended, with several members of the community joining current and former extension agents, board members and staff. Agriculture Extension Agent Pat Hardesty gave a brief presentation on the history of extension service in Taylor County, and County Judge-Executive Eddie Rogers presented a joint city/county proclamation to the extension office (Campbellsville Mayor Tony Young could not be in attendance) for their work in bettering the lives of Taylor Countians. Several partnering extension organizations had displays set up at the event, such as the Green River Beekeepers and many others. The staff today includes Agriculture and Natural Resources Agent Pat Hardesty, Family and Consumer Sciences Agent Audrey Myers, 4-H Youth Development Agent Amanda Sublett, and Horticulture Agent Kara Back, as well as several assistants, staff members, and volunteers. For the past century, the Extension Office has provided the citizens of Taylor County with a variety of services, information, and programming aimed at bettering the lives of local citizens. The Taylor County Extension Office is operated through the University of Kentucky as one of the state’s land-grant colleges. The beginnings of extension services can be traced back to 1914 with the Smith-Lever Act, with the goal of taking practical, unbiased, and research-based information from land-grant colleges (particularly the University of Kentucky and Kentucky State University). The first Taylor County Extension Office was established in 1918. It was located on Main Street in the old Bank of Campbellsville with the first Taylor County extension agent, J.L. Miller. From there, the extension office later moved to the bottom floor back offices of the Atlas Building, and then later to the basement of the courthouse annex. In 1988, the office moved to the Southern States regional office. Finally, in 2000, the extension office moved to its current home, a 15,500 square foot facility on South Columbia Avenue across from Amazon.